The Whatcom-Skagit Branch of the Industrial Workers of the World (IWW, or Wobblies) is organized to help workers gain their rights and more power in their workplaces, form unions that are member-controlled, to support one another in our efforts, and to spread solidarity around the region. Our branch was chartered by the IWW General Administration in January, 2015. IWW is a dues-paying, membership controlled union and solidarity organization.Dues are low and based on income. All workers are urged to join us, one-by-one or by the whole shop. See the ‘Join IWW‘ page to learn about membership. We especially seek food service and retail workers to join us and help spread our organization into those industries. Whatcom-Skagit IWW membership continues to grow. Our members include cooks, bartenders, baristas, roofers, bookkeepers, teachers, warehouse workers, legal workers, musicians, students and retired people. Many of us have taken an Organizing Training course (offered by the Organizing Board of the IWW). Some members are organizing in their workplaces. In 2015 we walked picket lines for other unions (for example, the United Steelworkers 12-591 at Tesoro in Anacortes, and SEIU 1199NW hospital workers at Saint Josephs in Bellingham). We look forward to having our own IWW shops organized. We have a seat on the Northwest Washington Central Labor Council. and may be the only IWW branch anywhere represented on a CLC. Before the famous victory of the Familias Unidas por la Justicia farmworkers union at Sakuma Bros. Farms, we marched, boycotted and picketed in solidarity. Follow Whatcom-Skagit IWW on facebook! Bellingham IWW hall at 604 W. Holly, around 1919. IWW was formed in Chicago in 1905. We are trying to learn about the early 20th Century history of the IWW in the area (see our webpage devoted to this). Many records were destroyed during police and vigilante raids during the post-WW1 ‘red scares’. We know there was an active membership in Bellingham in 1906, only one year after the organization was formed, as the union took a strong stand against the infamous expulsion of Sikh workers in Bellingham. The IWW issued a statement denouncing the anti-Sikh riots by workers and merchants as “injurious to the welfare of workers”. We are still learning about IWW in Bellingham in the first half of the 20th C. We are combing newspaper and in-house sources for more information. Bellingham wobblies gather for May Day, 1981. 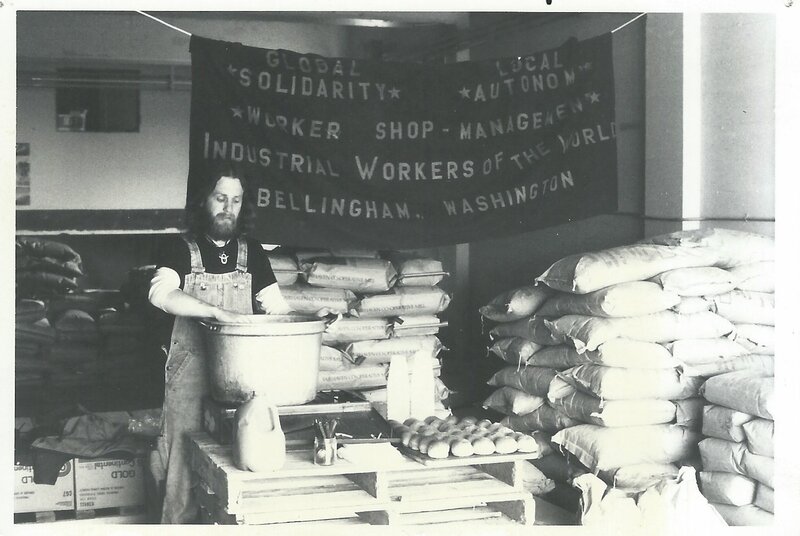 There was a very vibrant IWW General Membership Branch (GMB) in Bellingham in the 1980s and early ’90s. We organized workers in a number of shops and had a diverse and active membership. Several dozen Bellingham wobblies walked picket lines with striking workers (ILWU and ATU Greyhound strikers come to mind) and ran a Labor Film Series at the Central Labor Council hall. One of our most successful programs was ‘Food for People’. IWWs and supporters got food donations from local grocers and put on a monthly dinner, sometimes serving 100 or more, followed by labor films, speakers, and musicians. 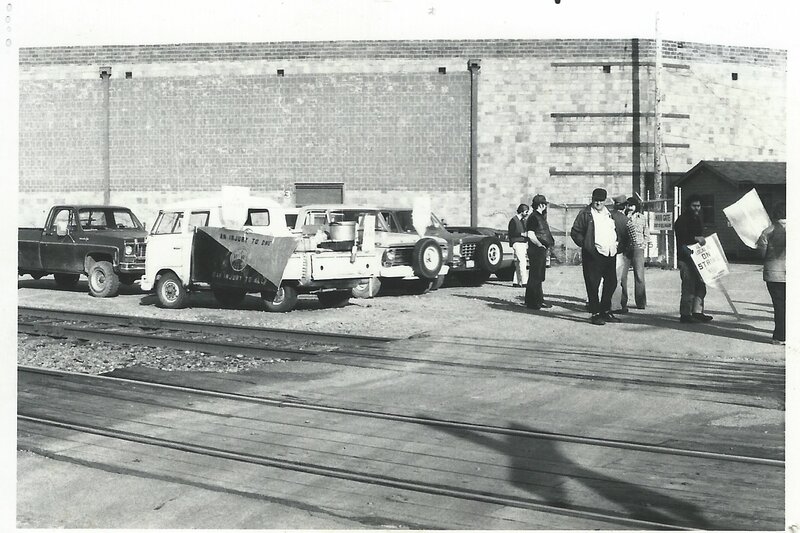 There was one Job Shop, Fairhaven Cooperative Flour Mill, and successful job actions at several other companies, including Brentley Softpacks and among the Vietnamese workers at the Mount Baker Mushroom Farm. We also had some damn fine May Day parties and other socials. One of those members was elected to serve in Chicago as the union’s General Secretary Treasurer. The Bellingham GMB of that era eventually faded away as members left town for work, or had kids, or decided to direct their interests elsewhere. The new Whatcom-Skagit General Membership Branch was chartered in January, 2015, and membership has grown steadlily. We are organizing injured Hispanic and other workers to challenge discrimination and malicious harassment by WA L&I, who utilize State police power actions to support employers against workers. L&I colludes with other State agencies, especially the State Attorney General to coerce and eliminate those providers who support injured workers. We would like your help in our effort to address this injustice. Perhaps we can facilitate the enrollment of hundreds, or even thousands of these injured workers in the IWW. Hoping you are interested. My phone #: 360-661-6126. Hi, I heard that there is a call for a national prison strike on September 9th. I want to know if your group is organizing an action for that day? Sorry for late response. The September 9th prison strike is called by IWW’s Incarcerated Workers Organizing Committee. Several hundred prisoners in US prisons have taken out IWW membership. We do not have a local IWOC committee. The Whatcom-Skagit IWW branch has not made specific plans for an action but it is under discussion. Do you have particular ideas?